Learn what the standard tuition charge is for U.S. colleges, and how Cal Poly San Luis Obispo stacks up. How Much Will Costs Increase? Get a better idea of the tuition and fees charged by California Polytechnic State University - San Luis Obispo so that you can plan successfully for 4-6 years. Examine the stats below to learn how California Polytechnic State University - San Luis Obispo's cost stacks up to other colleges and if you should plan for tuition increases. How Does California Polytechnic State University - San Luis Obispo Measure Up To Other Schools? The next table outlines how Cal Poly San Luis Obispo measures up to other schools nationally, regionally and by state. Cal Poly San Luis Obispo fees and tuition is lowered dramatically for students from California. For in-state students, tuition and fees is set at $9,432 for the 2017 - 2018 year, 55.7% off the price charged to out-of-state students. Tuition is $5,742 and fees $3,690. Cal Poly San Luis Obispo out-of-state students paid $21,312 in tuition and fees in 2017 - 2018. $3,690 was fees, and $17,622 was tuition. How much does Cal Poly San Luis Obispo cost part time? View Cal Poly San Luis Obispo cost per credit hour here. 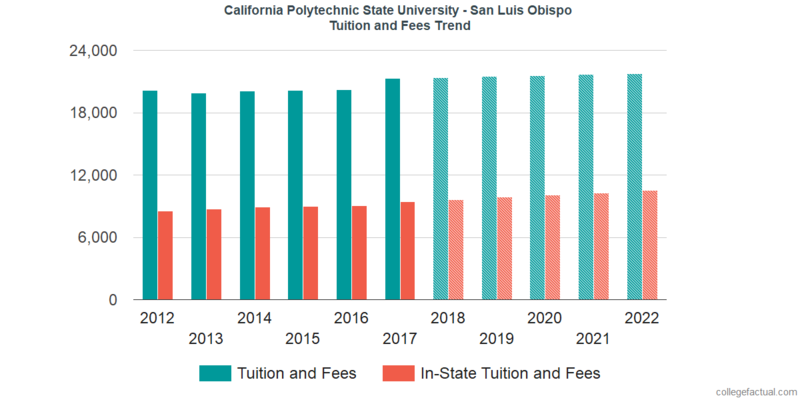 California Polytechnic State University - San Luis Obispo tuition and fees for out-of-state students grew at a standard annual rate of 0.4% in the last 5 years. In the same time period, tuition grew by 0.0% and fees grew by 2.4%. Due to this, we estimate the cost of tuition and fees for this year will total $21,399. For a two-year degree, we estimate tuition and fees will be $42,886 and for a four year degree to be $86,125. This does not include additional costs including room and board, transportation, and books. Look at this next chart to see how Cal Poly San Luis Obispo tuition and fees might develop including residency based discounts in the future. Mainly due to inflation as well as other factors, the price of college is likely to increase every year. For this reason your final year of college might be much more than your first year.